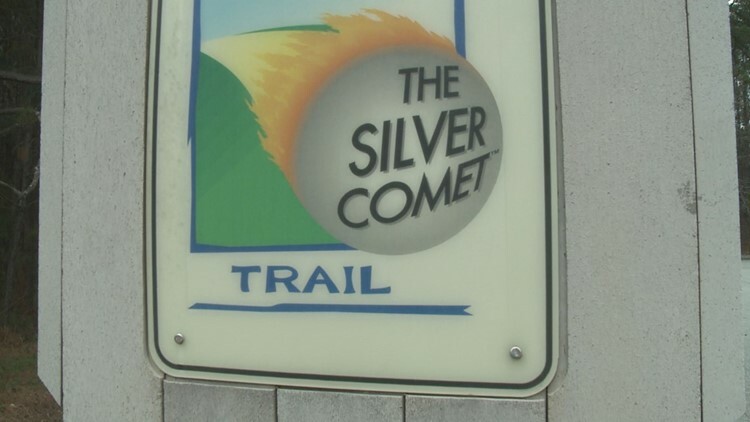 A man claimed he was robbed by two armed suspects while riding his bike on The Silver Comet Trail, near Austell, on Jan. 18, 2019. Two men armed with guns laid branches along the bike path, which forced the man to stop and get off his bike, according to police. AUSTELL, Ga. — A 52-year-old man told police he was robbed at gunpoint while riding his bike on the Silver Comet Trail in Cobb County. The man said he was riding along the trail on the afternoon of Friday, Jan. 18 when he saw two men laying tree branches along the bike path, according to the Cobb County Police report. He stopped and asked the men if they put the sticks there and they told him no. He bent down to move the sticks and when he looked up, both men were pointing guns at him, according to the report. The man gave the suspects his cell phone and they ran off. The man was able to track the exact location of the robbery using a fitness tracker app on his phone. He said it happened near Anderson Mill Rd., east of Powder Springs and west of Floyd Road in Austell. The two suspects turned off the tracker after the robbery, according to the report. The victim described one of the suspects as Hispanic, about 18 years old, with a mustache and wearing a gray hoodie with blue jeans and tennis shoes. He was armed with a .38 semi-automatic handgun, according to police. The second suspect was described as a black male, about 18 years old, clean shaven and about 6 feet tall with a thin build. Both suspects had hoodies on, the victim said. The man told police the first suspect pulled the hammer back on his revolver and seemed "to be in charge," according to the report. The other man kept his gun to his side. No arrests have been made. Anyone with information is asked to call Cobb County Police.